eCite - Large igneous provinces: Progenitors of some ophiolites? 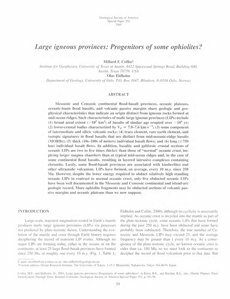 Large igneous provinces: Progenitors of some ophiolites? Mesozoic and Cenozoic continental flood-basalt provinces, oceanic plateaus, oceanic-basin flood basalts, and volcanic passive margins share geologic and geophysical characteristics that indicate an origin distinct from igneous rocks formed at mid-ocean ridges. Such characteristics of mafic large igneous provinces (LIPs) include (1) broad areal extent (> 105 km2) of basalts of similar age erupted over ~ 106 yr; (2) lower-crustal bodies characterized by V¦± = 7.0-7.6 km.s-1 (3) some component of intermediate and silicic volcanic rocks; (4) trace element, rare earth clement, and isotopic signatures in flood basalts that are distinct from mid-oceanic-ridge basalts (MORBs): (5) thick (10s-100s of meters) individual basalt flows; and (6) long (¡Ü750 km) individual basalt flows. In addition, basaltic and gabbroic crustal sections of oceanic LIPs are two to five times thicker than those of "normal" oceanic crust, implying larger magma chambers than at typical mid-ocean ridges and, in the case of some continental flood basalts, resulting in layered intrusive complexes containing chromite. Lastly, some flood-basalt provinces are associated with kimberlites and other ultramafic volcanism. LIPs have formed, on average, every 10 m.y. since 250 Ma. However, despite the lower energy required to obduct relatively high standing oceanic LIPs in contrast to normal oceanic crust, only five obducted oceanic LIPs have been well documented in the Mesozoic and Cenozoic continental and island-arc geologic record. More ophiolite fragments may be obducted sections of volcanic passive margins and oceanic plateaus than we now suppose.